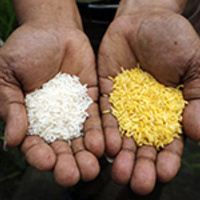 EVENT: Nobel laureate Sir Richard Roberts’ public talk about the global effort to bring genetically modified Golden Rice to malnourished populations around the world. WHO MAY ATTEND: Event is free and open to the public, but seating is limited. Call 512-270-0967 or e-mail ccervini@utexas.edu to RSVP. BACKGROUND: Sir Richard Roberts is an English biochemist and molecular biologist. He was awarded the 1993 Nobel Prize in Physiology or Medicine with Phillip Allen Sharp for the discovery of introns, bits of DNA within the genes of complex organisms such as humans that aren't turned into proteins, and the mechanism of gene-splicing. He currently works at New England Biolabs near Boston. Golden Rice is a variety of rice produced through genetic engineering to biosynthesizebeta-carotene, a precursor of vitamin A, in rice. The research was conducted with the goal of producing a fortified food to be grown and consumed in areas with a shortage of dietary vitamin A, a deficiency which is estimated to kill 670,000 children under the age of 5 each year.